About a month ago, I bought a HTC Wildfire. It’s a budget Android phone, which packs a nice set of features (wifi, gps, …). The pre-installed build of Android, customized with HTC Sense is not bad, but on a device with a relatively weak CPU, it’s a shame to see how HTC is lagging behind on updating to a newer Android version: the phone was running Android 2.1 (Eclair), whilst Android 2.3 (Gingerbread) has already been out for months. Also, some HTC apps and services are unremovable. This market fragmentation is one of the key problems for Android: Vendors customize and brand Android so extensively that not only the updates lag behind, but the user experience is hampered, and the phone essentially becomes very locked down, leaving the user guessing whether or not he will receive further (security) updates. Update: This guide was written for WildPuzzleRom originally. Due to the increasing popularity of this guide, I’ve rewritten all steps so they can be applied to pretty much any great rom out there for the HTC Wildfire, like Openfire or the recent Cyanogen. The first thing you have to do before you can go experimenting with custom ROM’s is rooting your device, essentially giving you, the user, access to pretty much anything on the device – and thus allowing you to swap ROM’s, kernels, … The term “rooting” reveals the actual inner workings of Android: the super-user on Linux systems is called root, and Android uses the Linux kernel. You need the charged phone, the micro-USB cable that came with it and a Windows or Linux computer. I haven’t tried it on a Mac, but other users are reporting success too. I’ve split up the rooting part of the guide in two sections: rooting a Wildfire which is still running 2.1 (Eclair, the Android version which it shipped with originally), or Wildfires which have been shipped/auto-updated to 2.2 (Froyo). The original HTC ROM (based on Android 2.1) can be rooted with the excellent Unrevoked tool. 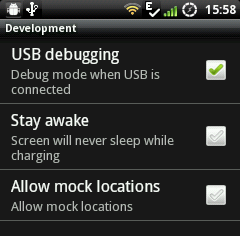 Just plug in your phone and make sure USB debugging is enabled (settings -> applications -> developer options). Your phone will warn you that it is enabled when you connect it to your computer. Linux: On my Ubuntu (Maverick Meerkat 10.10) laptop, the phone was recognized immediately. I had to run the Unrevoked tool as root, though. Just navigate to where you downloaded the tool and run sudo ./reflash in console. Windows: installing HBOOT USB drivers is required, as detailed on the Unrevoked help page. Note: 64 bit versions of Windows can be “quirky” with Unrevoked. Some systems may – or will only – work with BOTH the HTC and HBOOT USB drivers installed. The HTC drivers are installed with the HTC Sync application, which can be downloaded from HTC’s website. If Unrevoked fails (‘stalls” or “hangs”) part way through on a 64-bit Windows version, don’t freak out, just run it again. You may need two, three, or more attempts, but it eventually gets the job done. Note that you should resist the temptation to pull the battery during these attempts. Don’t touch the phone during the reflash, even if it takes a long time. It took about 3-4 minutes on my device, but this may vary. The phone might reboot several times during the reflash. The phone will automatically restart when the process is finished. Unrevoked will have granted you root access to your phone, and installed a recovery tool to your phone’s recovery memory, called ClockWorkMod. From now on, ‘booting into recovery‘ will be possible. Clockworkmod allows some funky stuff, and is used for flashing new ROM’s, making backups an partitioning SD cards. Also, an extra app called Superuser will have appeared in your app drawer. Using this app, you can control which other apps can get root privileges. If you just wanted to have root access to the phone, you can stop here. The apps on the market which require root access will work now. Skip to section 2! For a long time, HTC Wildfires which shipped or were updated to Froyo (2.2) could not be rooted, due to a new HBOOT version HTC pushed to devices. Luckily, teams AlphaRev and Unrevoked joined forces and released Revolutionary: http://revolutionary.io/ The tool seems to be in a great state right now, so if you’ve updated your phone to 2.2, or your Wildfire came shipped with 2.2, this is probably the best option. All tips and hints I gave in the previous section (don’t touch the phone, be patient, …) are still valid, you’re just using a different tool. Before doing anything, make a backup. We can do this using the installed ClockWorkMod recovery tool – we call these backups Nandroid backups. To access the ClockWorkMod recovery tool, we have to boot the Wildfire in the (now unlocked) recovery mode, which is basicly a lightweight little system that allows system operations. Boot the phone by holding down either the circle button or Volume Down button, then press the Power button. This is what we call a cold boot. Select Recovery from the menu. (You can navigate the menus with the volume button, and make selections with the round trackpad button). Download the latest version of your ROM. It should be a zip file, varying between 60 Mb / 120 Mb in size, depending on the functionality the ROM offers. You can find a nice overview of current Wildfire ROMs, sorted by release date on the XDA forums. The Every ROM has its own forum thread. The most popular ROMs at the time of writing seem to be CyanogenMod, WildPuzzle and Openfire. Make sure you have a look around the forums for the threads about the ROM you want to install. A lot of these ROM’s are in active development, and their might be last-minute bugs that are handy to know about beforehand. Transfer this zip file file to your SD card. Remember where you saved it, it’s easiest if you just put it in the main directory. Select Wipe / Reset Factory Settings. This will erase your current ROM memory. This makes sure no conflicting settings or apps are left over from the original OS. This is an important step: if you don’t do this, you will most likely experience bugs and glitches! Select Install zip from SD card and navigate to where you copied the ROM zip file. Watch out: Do NOT select the similar-looking apply sdcard:update.zip menu item. You have to confirm by selecting the correct ZIP file from a list. Select it, and let it install. This will take about 7-8 minutes, but this can vary. Progress is reported on screen. Don’t pull the battery while flashing a new ROM. Reboot the phone. Warning: First boot could take up to 12 minutes, during which you will mainly see a black screen. This is because the Android OS is unpacking the new applications. If you are really worried and want to know what’s going on, you can connect to the phone using the Android Debug Bridge, which can be found in the Google Android SDK. This is not harmful, but involves some command-line wizardry and thus is for advanced users only. Just sit back and get a drink, if you followed the guide, your phone’s fine. And besides, you made a Nandroid backup, right? Even if you did screw something up, you can always boot back into ClockworkMod and restore that Nandroid backup, which restore your phone to the exact state it was. 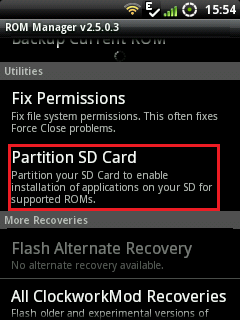 Most of the Froyo roms out there allow you to move downloaded applications to your SD card. This will use the built-in Android functionality of moving parts of programs to thet FAT partition, in a (hidden) folder called .android-secure. This frees up some internal phone memory (which is limited). This possibility to do this is limited: an app has to support this, and not all data is moved to the SD card. The good news is that you don’t have to do anything to use this functionality: no partitioning is required. You can skip this section completely if you’re okay with Android’s default apps to SD-functionality. Some ROMS come with an Apps2SD script, most notably DarkTremor’s script. Check your ROM’s documentation for this. For example: WildPuzzle ROM has thiss cript, Cyanogenmod doesn’t because the script does not meet their code quality requirements. The Darktremor script requires an EXT partition and moves all downloaded apps to that partition completely, freeing up a lot of space on your phone. If you install a new app from the market, it will get installed to this EXT partition as well. (For the more technical peeps: Apps2SD simply symlinks the app’s location to /system/sd/app/(name of the app), where sd is the EXT partition.). An additional advantage of having two partitions is that while you are transferring stuff to the FAT partition, all your apps will be available, since they’re on the EXT partition. Choose Flash ClockworkMod Recovery. This will download and install the latest version of the recovery tool. Since it is such a vital tool, always make sure it’s up to date. The phone will reboot and partition your SD Card. Boot the phone again – this can take a while, since an A2SD script is now transferring apps to your SD card. Again, have a coffee. It took about 7 minutes on my phone, but this can vary. 5. Done – Party Time! Most ROM’s come packed with a custom kernel, which allows overclocking. Cyanogenmod 7 has a built-in CPU management tool. In other ROMS, you can set your CPU speed using this application. It is not recommended to clock the kernel to 768 Mhz as in the screenshot below. Any value over 700 Mhz is likely to make your phone unstable. I personally run at 691, and it runs stable. SetCPU also allows you to check your CPU temperature, which is at a steady 32 °C for me. You can also define profiles in SetCPU. For instance, when my battery gets too hot (> 40°C), the CPU will automatically scale down to a lower clock speed. Also, when the screen is turned off (and no interactive speed is needed), the clock speed also scales down. Most of the ROM’s for Wildfire are in active development: so there might be problems /bugs along the way. Please refer to your ROM’s forum thread for information. It would be preferred to ask for help in the comments there instead of here. 152 Responses to "Installing Wildpuzzle/Openfire/CyanogenMod ROM for HTC Wildfire"
Thanks for this guide, I’ve been searching for concise instructions for a while. Everything worked and I now have a Froyo Wildfire! hii..thanks..for the detailed info about installing rom. Now i hav froyo. but what is flashing? ?…nd what is the use of it? ?…XDA forums hav bunch of files to flash but i donno what to do wid those..? ?…can u explain plzz..
hii..y’day it worked fine…but today when i did it again…der seems to b a problem.I actually did it again becoz WF freez when i was flashing..
after i select “partition of SD” ..it restarted …and i cud see android symbol too. but then it kept on restarting again nd agin..like 6-7 times.Then i got frustrated and removed my battery.Then again i tried ,but same thing happend. Now i again installed wild puzzle…but didnt do partitioning…what is d problem?? @rajesh : Did you do a full wipe first? If you partition your SD, wil it format it? if i do that then will all my music and pictures be lost? How long is that in practice? I am with off-the-shelf ROM Android 2.1 some unlocked Vodafone set. I stopped everything I could imagine, even the cellphone radio during the nights. Hardly, I can get 2-3 days without charging – just few calls, les than a hour WiFi in total, no 3G at all. Very nice! Thanks for your detailed guide. I am in 2.2 now. Thank you Jeroen, for your excellent guide! Small note: unrevoked had to try at least three times on my laptop before getting root. When I installed WildpuzzleROM v 8.0.10 .I can’t use Google Map in China. Jaroen, same thing like RAJESH! after partitioning SD CARD IS WIPED no files at all, that causes bootloop. rom manager 2.5.0.4 did every single move you described. Hi Jeroen, thanks for your detailed guide. Just a note though, from what I understand, there is no need to partition the SD-card, as Froyo’s built-in apps 2 SD functionality moves apps to the existing partition. Scott. No, I think there’s a custom script (DarkTremor) used to provide Apps2SD functionality. It only works with EXT filesystems. Thanks for this, but there’s a problem. I can’t access the App Market anymore. When to do a full wipe after rom installed and before partitoning or at the beggining? As you can read in the guide: at the beginning. Jeroen, same thing as rajesh and ucxoq! Followed your guide to the letter and after partitioning SD Card (used defaults) and CRM does partioning and on second boot phone gets stuck in bootloop. Pulled out the SD card and WP ROM loads okay- however after replacing SD and rebooting normally many apps included in WP are missing (eg ROM manager), so seems to agree with Scott that apps were already moved to SD card? I think Scott is right- maybe we don’t need to Partition SD. Anyone know what is right? Brilliant guide thx a bunch !!!!! I run it manually from time to time. do we still need froyo using ROM ? in http://developer.htc.com/ they have froyo for wildfire . did you ever try ? He He.. its done ..
@macine: That’s just the kernel source for the Froyo version. The actual ROM itself hasn’t been released yet. And yes, there still will be a need for a good ROM even after froyo is released. Patched market, working wifi tether, root functionality. And it’s not even sure whether JIT will be enabled in the official build. thank you it’s work! awesome! . but i got problem on friendstream . my friendstream doesn’t work . even i clear cache , remove facebook and install it again . like in other forum said . still doesn’t work can you help me ? Best guide on the web by far! Very nice! Overclocking with SETCPU, SUPERUSER…………..amaaaaaaaaaaaaaaaaaaaaaaaaaaaaazzzzzzzzzzzzzzzzzzzzzzziiiiiiiiiiiiiiiiiiiiiinnnnnnnnnnnnnggg! Successfully installed WildPuzzleRom. However I noticed that it can’t find my location. It always think I’m in Europe (which i’m not) when I tried to run map application. Do you have any idea about this??? Can’t thank you enough for this! I’ve been searching for a week for a simple guide like this. I’ve been on engadget, lifehacker, multiple forums, etc, and still couldn’t find something simple and concise like this. i can just move some app to sd card and some didnot move what s rong with me help me ? i have a question: how i transfer the apps to my SD card or install them to SD card ? Thanks for all the great comments guys, I’m glad you like the guide. I do like to point out again that all problems and issues should best be reported in the WildPuzzle thread on the XDA forums. This way, you’ll get more help with your issues! hello thanks for your detailed tutorial..
i just want some question..
should before i flashing i need to debrand first ? Succesfully installed it, but now can’t access the market application either. Any ideas on how to fix this? Eka, don’t bother flashing the phone to the Wildpuzzle ROM if you want to keep Swype. There is no working version of Swype post wildpuzzle install. and work with live wallpaper..
@Jeroen . hey if i want to remove this, how to do it ? just uninstall ? or what ? @macine: Just restore your nandroid backup from step 2. 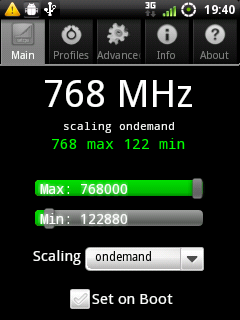 I’ve overclocked my CPU @ 768Mhz on the official HTC ROM with Sense. The temperature is a steady 34° and, since it seems too much, i would like to know if the Wildfire’s CPU can handle it. Of course, you have to TRUST the developers (of ClockworkMod and Wildpuzzle) that they aren’t doing other things with your phone and/or information. How do any of us know whether we are being tracked, or whether we’ve installed bots, or maybe the cam is taking the odd pic without our knowing it? That’s a lot of trust to have in some spotty-faced teenaged boys fiddling in their basements. Especially since ClockworkMod doesn’t provide any way of removing it, like any good developer would. WWE is the world-wide English version, See RUU_Buzz_HTC_WWE_1.25.405.1_Radio_13.45.55.24_3.35.15.31_release_142189_signed.exe. It restores the full stock ROM and bootloader, getting rid of CLockworkMod and unrooting. Can I translate this instructions to chinese, and than post to other forum? thx!! I desperately need some help. I rooted with UnRevoked 3.21, followed all of the steps given in the guide above, but when I reboot the device, it never does. I left it for an hour and it never booted into the ROM. So i took the battery out and started again, I don’t know if this is a bad thing or not because I’m a newbie but I can still boot into Clockwork and perform the install, yet it still won’t boot up. I did perform a Nandroid backup straight after the root, but when I went to do a Nandroid restore after my first failed attempt, I got the message “no files found”. Is there anything that I’m doing wrong ? Am I able to still boot into WildPuzzle ROM? Or how to restore to the Stock ROM without a Nandroid backup? Also, when I do hit the reboot button, instead of a black screen, I get the pink wheel instead. and re-install the original firmware (including bootloader) from HTC. If you have a problem with it recognising your device, uninstall the driver and re-install the HTC Sync applilcation (which will re-install the correct drivers). Sorry scott, I’ve been searching round for the past three hours for help in the meantime. I stumbled across this and tried it but to no avail because I cannot actually boot into a live ROM, therefore it won’t recognise the phone. However, I am now going to try your suggestion. Well I booted into Clockwork Recovery and mounted USB, my Computer recognised the Phone (well SD card) so I ran the RUU but it still said that HTC Sync didn’t recognise my phone… Is there any other way to boot ? @Alex – you must *exit* HTC Sync before you run the RUU, otherwise HTC Sync will try to connect to the phone, and RUU will not be able to. You need to install HTC Sync for the drivers, but then exit it (make sure it is not running, not even the icon in the status area – right-click on the icon and select ‘exit’ from the menu), then run RUU. Hope this helps. Is this a newer release? I was wondering if I could use this one instead? Still no luck Scott, I quit HTC Sync just like you said and the ROM Recovery progam still appeared when installing a RUU. So I uninstalled HTC Sync. But when I ran the RUU, the same program popped up, and then after going through the process, it still said it could not find the phone. I went back to standard recovery on the phone instead of Clockwork, installing the Android Boot Interface driver on the Computer and ran the RUU. But still I can only get to the stage where the ROM Recovery says that it cannot find the phone. Well, I managed to fix my phone! Whilst eating breakfast I had an idea; I flashed v7.31 Wildpuzzle, which worked instantly. I now believe that v8.0.11 is unstable and should be avoided. Thanks so much for your help Scott. @Alex – no problem. Personally, I would recommend using the RRU to go back to the stock ROM, if I were you. It’s clear the guy working on Wildpuzzle doesn’t have a proper testing regimen in place, and the next time you may just end up bricking your phone. And as I’ve said before, you have no way of knowing what kind of stuff is being done with your phone with Wildpuzzle and/or ClockworkMod. Scott, I totally understand, I think I might do that anyway tbh, they won’t be as stringent as HTC would be. RRU 1.37 may be a newer release, but I haven’t seen it distributed yet, and Android 2.2 is scheduled to be distributed within the next few weeks, so I just RRU’ed back to the release which was originally on my phone and will with for the regular updates. If you install 1.37 and something goes wrong (for example, if it was made for a CDMA phone or if it your phone later fails before the warranty expires) then you may have problems returning it under warranty. I would like to thank you for the “installation guide”. I lost my Wi-Fi after accepting the FOTA from HTC and I was helpless. Now I’ve got my Android back. Apparently this depends on the ClockWorkMod missing from my Tattoo: in fact, I could not find a way to install it. My wildfire, after installation of new ROM, hangs.. (All the keys and touch becomes non-functional), unless I take the battery out and reboot the phone. Hey thanks for the instructions! It worked perfectly! @ Ignas -> i faced the same prob.. install htc drivers again (uninstall htc sync too after installation so you keep only drivers). This should make the unrevokd3 to go past the “waiting for device” thing. Now my wildfire running 2.2 at 691Mhz clk frequency. mer specifically 3.5 everytime i Select “Install zip from SD card” it just gives me a black screen that only lasts for a couple of minutes then it restarts.. it doesn’t give me a list of zip files.. pls help..
Hello. my friend tried to fix this roms and he didnt do the backup, and now when he is trying to install it it only come up the android guy on the screen. After that nothing happens. He followed the step and everything was good until that showed up. How can he fix that? Got stuck after installed ROM (step 3.7) it just shows HTC in white screen and keeps standing there… what to do? My phone is still stuck on 3.7 Has a list of devices on the phone and other info. Is this right? Hi, can you help please?? I can’t root my HTC wildfire, is there any alternative to unrevoked3? Help, I’ve done steps 1 to 3 and run the Wildpuzzle zip but on reboot only get white HTC screen indefinately. Tried a few times, same problem. Tried Nandroid restore, takes me back to factory setting, but now have problem that phone wont ask for USB mount and goes into charge only without asking. PC does not see SD or phone. In Korea, there is no information about WildFire rom. The guild was good and everything went well and perfect. I have only one problem that is all my previous data and apps are GONE! after the wipe data process. Anyway to recover them back? I had my nandroid backup and moved all my SD Card data into my computer. I just need to know how to move back my apps to my phone, thanks! mobile internet for me doesn’t work, any help? also rom manager don;t work so i can’t setup ap2sd…..
no data service at all, I can;t establish a connection with market….if you don’t know how to build s rom don’t do it at all…who is going to fix my phone now?????? WTF!! !Emmergency needed help!Why I kept restarting on the clockworkdMod recovery there?I can’t jump back to the original rom after wiped all the data,another I also forget to transfer the Wildpuzzle into the phone,so my phone is stucked now!!!!Help! it did’t work by my wildfire. It istalled within 3 minuts and when he rebooted he did’t came any futher than tha android in the screen. What must i do?? And when i recoverd with nandroid it seems that not everything recoverd that well..
pleasr help i’m not so techicel. was done perfectly , but how i can recover my data like(sms’s and call history? when i install wildpuzzule i reboot then i get a black screen with a pink circle what do i do ? Any help to fix the SD card and get the right Fat32 + ext2 partitions?? I followed all the steps and after rebooting the phone shows a white screen with htc written on it and the phone stucks there.Please help!!!! i have Froyo on my Wildfire Now! with WlidPuzzle ROM! – TAADAAA!!! i have Froyo! – Why i got the error message for formating SDCARD? – How to check the SDCARD is formated correctly for A2SD? For the mobile data to work you need to contact your Provider and get the APNs off them. i would probably wait, since i cant overclock my spu, the rom runs a little MORE laggy than the official 2.1 i had on the phone, although, if youcan get overclocking to work then yes, i suggest this! Could you please tell me if partitioning SD card required? I dont plan on using apps2sd. Is it safe to flash the ROM and remove apps2sd application after installing the ROM and rebooting into WildPuzzle? Thanks for your excellent guide. I tried Wildpuzzle 8 on my HTC Wildfire but it was buggy and kept on crashing and freezing so I put CM6 on instead and wow what a ROM. None of the bloatware as with the stock rom or even Wildpuzzle. The speed difference is awesome and can be overclocked further with setcpu. The only problem with CM6 is video recording doesn’t work but I can live with that. If anyone is having problems finding ADB drivers to get unrevoked3 to work. It took me 4 hours of searching through forums, installing SDK +framework2.2 +java, uninstalling the former. Search for Speedy0339. Thanks Speedy you saved my life. I have both the 32-bit and 64-bit drivers and would love to put them on the unrevoked website but haven’t got an email address of any of the developers. sorry! my english is to poor. can you fix chinese language? y i cant root my wildfire by unrevoked??? how fix GeocoderProviderService.apk and NetworkProviderService.apk? I have problem with my WF ,when I wanna root my device, unrevoked software say to me cant install sevice ! I have alsharif with persian font support on my device. Thank for your WildPuzzleROM！I ready build ROM by myself，but I don’t know how to add Live wallpaper in HTC SENSE？ maybe modify framework-res.apk, but I don’t how to do it? Can you help me? What can i say? The best step by step instructions i have ever used for any device. THANKS!!!! How do I unroot the phone? im a newbie in this forum also with HTC wildfire. i just want to know, if i root my htc, what about the warranty? the warranty finish or not? could anyone please answer my question..
and you can downgrade very easy. It required Windows computer, because I have on my notebook only Linux I used VMWare machine with Win7 and it worked. downgrade official ROM don’t work. u mean i cant root my wildfire v.2.2 (froyo)???? please reply and teach me..
You’ll have to wait for a way to root the HTC 2.2 release, unfortunately. please tell me if I’m right /wrong, and if i should carry on with the root. Please let me know ASAP. I really want to get this done and overclock my Wildfire. but i dont know a2sd is working or not. i have tried a lot to check but could not verify whether a2sd is working? pl give more information abt that. I have tried to find out latest version of wildpuzzle rom but all xda links are not working. Hi there, what can be done with Android 2.3? if i hav a wildfire shipped with 2.2 then i hav to directly follow the instruction from step 1.2 na??? nthn b4 it na??? plzz reply!!! Software too new, got the HTC Wildfire at Froyo 2.2 HBOOT 1.002, got any other software to root? Nope, but you can downgrade your current rom to an earlier official one, and get an older hboot. Check xda for info. blog and would like to know where u got this from.